Wash the chicken and cut in into thin slices. Bring the coconut milk to a boil and add the galangal, lemon grass, shallot, and kaffir lime leaves. Add the chicken, salt and simmer slowly over low heat. 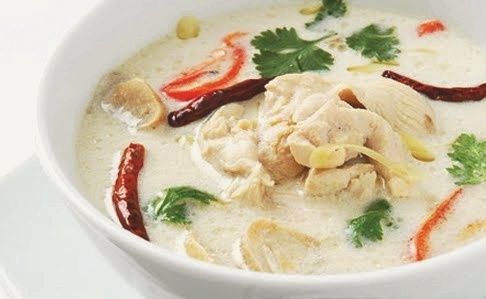 When the chicken is done, pour the coconut cream onto the soup, stir gently, and when the soup returns to a boil,turn off the heat. Add the fish sauce, lime juice, and chilies, transfer to a bowl, and serve hot.